After files from his campaign were recently attacked - in a "massive and coordinated hacking operation" - and subsequently posted on social media, it's not at all surprising that Emmanuel Macron would be angry. Most all people, who are otherwise socially adept and with good interpersonal skills, are able to accurately characterize others' emotions when they're present at higher levels. However, when these same emotions are displayed in mild or even in moderate amounts - it's amazing just how often people misidentify - or are even completely oblivious to them. Note Emmanuel Macron's lower eyelids - for they exhibit significantly increased tension. This is rarely noted by all but the most astute observers. His eyebrows are also lowered and slightly drawn together. 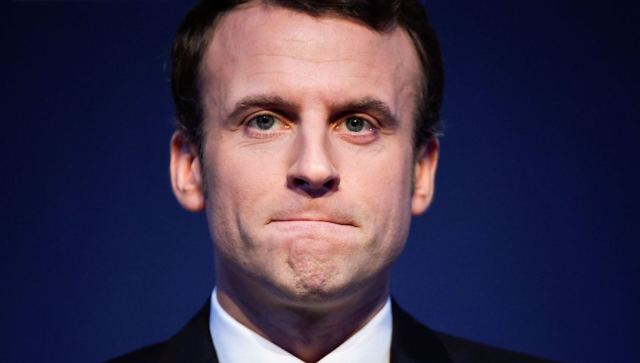 The French Presidential Candidate's mid-face is also significantly contracted. This is particularly evident in the area above his upper lip - as well as with the flaring of his nostrils. His lips are horizontally-stretched, thinned and rolled inward - to such a degree that his lower lip has disappeared and only the thinnest remnant of his upper lip remains visible. Because his jaw is also clenched, the area below his lower lip is bulging outward. Although from this angle it's difficult to seen, his jaw is also jutting forward. This mandibular clenching also has the secondary effect of dimpling the anterior surface of his chin. This photo is an excellent example of a nonverbal cluster of moderate-level anger displays. In the real-world, don't be the next person to gloss-over or under-appreciate such emotions.